Conspiracy Theory: Is Marvel Planning to Reboot Daredevil? Home » Comics » Conspiracy Theory: Is Marvel Planning to Reboot Daredevil? Looking through the Marvel solicitations and finding interesting nuggets which can be mined for clickbait articles is a monthly ritual in the comics news business. But can paying such close attention to the marketing materials of a major comic book publisher start to play tricks with your head? Who knows, true believers?! You’ll have to read our theory and decide for yourselves. • As DAREDEVIL’s crusade against the Kingpin moves into its endgame, the stakes have never been higher. 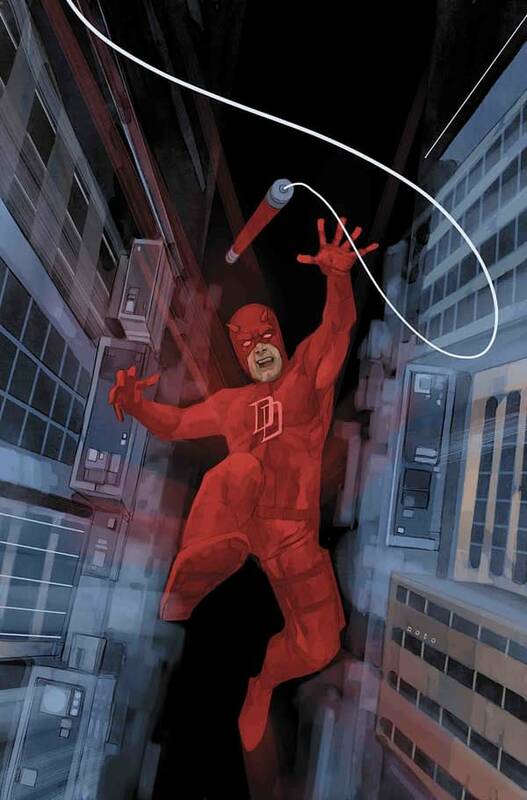 • The whirlwind adventure of the fall ends here, in an oversized and overwhelming DAREDEVIL epic as only Charles Soule and Phil Noto could deliver it. • Face forward, True Believers, this one’ll have you talking for MONTHS! It feels final, though in exactly which way could be up to interpretation. “The whirlwind adventure of the fall ends here” could refer to a the storyline. It could also refer to the departure of a creative team after wrapping up an epic storyline. It could also, if you were inclined to stretch it just a bit, refer to the end of a volume of Daredevil. We know that Marvel intended the Marvel Legacy era to be a temporary measure, with a Fresh Start to follow, including relaunches for series with Legacy numbering. Daredevil is one of the few holdouts. In fact, it’s one of two holdouts in the November solicitations, alongside Peter Parker: The Spectacular Spider-Man. And that book is tying into Edge of Spider-Pocalypse, or whatever the latest Spider-Man event is called, so it’s ripe for a reboot as well. But all of this is rampant speculation, it’s true. So let’s take a look at the sales numbers. Daredevil #605 was ranked at #96 on the Diamond sales charts, not in the instant cancel zone, but it could be doing better considering Daredevil is the cornerstone of Marvel’s television universe. The comic ranked 20 spots lower than a True Believers reprint of Fantastic Four #48, though slightly higher than a True Believers reprint of Fantastic Four #5. Comichron estimates it as selling 23,971. A new #1 issue would boost those numbers, potentially quite a bit if marketed properly (we know, often a stretch for Marvel). In October and November, there’s the Typhoid Fever event taking place in Hell’s Kitchen, but Daredevil isn’t involved in that. And Marvel is pushing the Marvel Knights 20th anniversary pretty hard right now, with lots of collections and a reinvented Marvel Knights mini-series. 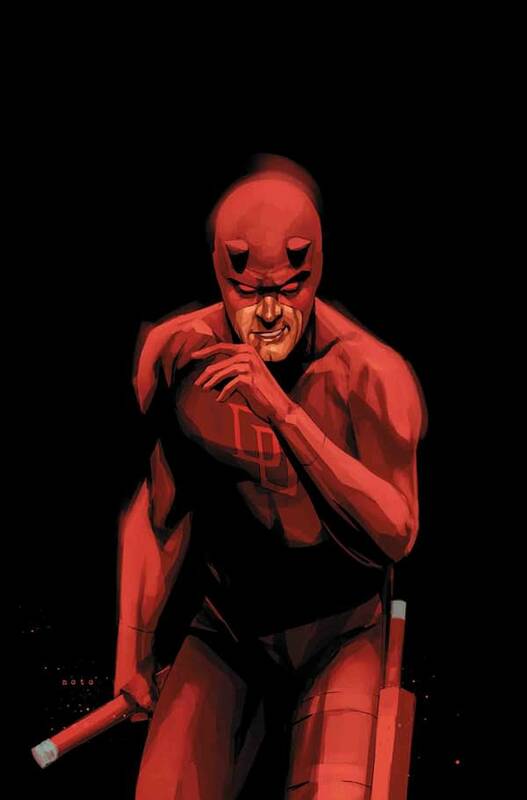 TEASER VARIANT COVER BY MIKE DEODATO JR.
And that mini-series is Daredevil-centric. One could argue that the Marvel Knights relaunch might not be set in-continuity, but that’s not explicitly stated anywhere. And what if Marvel planned to launch a Marvel Knights line out of that mini, and what if a Daredevil comic was part of that? Would Marvel want a legacy-numbered Daredevil series with middling sales muddying the waters for something like that? All we’re saying is, the time seems ripe for the current Daredevil series to end and relaunch, and everything seems to be perfectly aligned for that to happen. But there’s one more place we can look for evidence: the Amazon listings. Spinning out of the events of THE HUNT FOR WOLVERINE: WEAPON LOST, Matt Murdock faces a nightmare beyond his wildest dreams! Thanks to the Inhuman called Reader, the “twin brother” that Matt once created as a cover story – Mike Murdock – is now fl esh and blood! Much more than just Daredevil’s alter-alter ego, Mike has motivations of his own…and all the cunning and skill of his “brother” Matt at his disposal to make his dreams come to fruition. And things only get worse as Mike zeroes in on the people Matt cares about most! It’s a whole new brand of double trouble for the Mayor Without Fear! That trade is set to end with Daredevil #611. But in the solicits for Daredevil #611 and #612, which you may remember from above, #611 doesn’t seem to be the final issue of this story arc. But #612, an oversized five-dollar comic, clearly is. Would it make sense to make the first chapter of Daredevil: Back in Black #9 the final issue of the previous collection’s story? Or might it make more sense, if you’d recently decided to end and relaunch Daredevil, to release an oversized finale and add it retroactively to what would be the final collection of the volume, which doesn’t hit stores for six months anyway? All the evidence is here is admittedly circumstantial, and besides, we’ve written 18 clickbait articles today and consumed 5 cups of coffee in the process. So we ask you, dear readers, to decide: is this all in our head? No Ben Reilly: Scarlet Spider Past #25?